Regis Iglesias Ramírez above on the left. The 5th of August of 1994 in the morning my friend Lorenzo told me that he was going to the port. According to him, someone would attempt to take the tugboat. I wished him look. I saw him again around 2 in the afternoon, at that time there was an unusual movement of military trucks coming down Porvenir street. 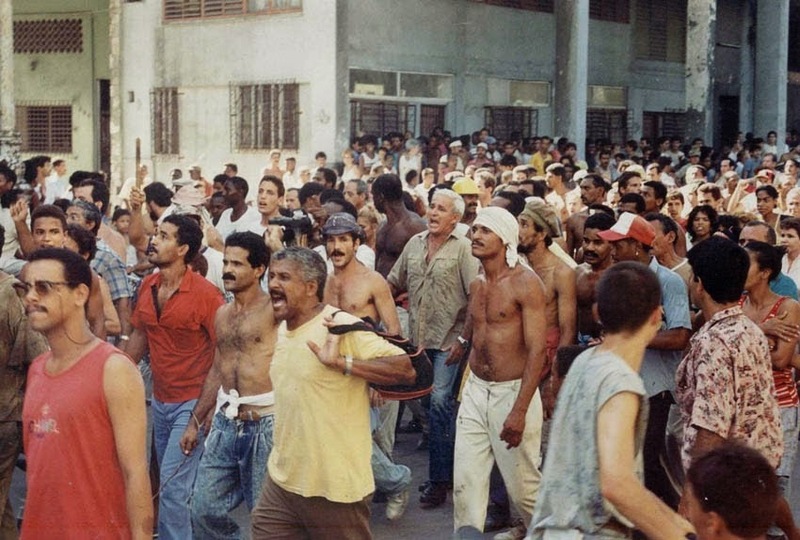 Lorenzo narrated the adventures of his failed escape attempt but claimed that another group of people had taken the "launch of Regla.” Overexcited he told me how people had spontaneously begun to protest in Havana and that the Malecon was seething. I got my back and moved quickly to Cerro. Oswaldo wasn’t there but Ramoncito Antuez was. Listened in his home on Carmen and Peñón to the news that from the exterior was beginning to transmit on short wave about what was happening in Havana. "Stay alert but calm in the neighborhood in case something happens. If the protest spreads to all municipalities I believe we should support it and give it political objectives. It cannot be us with our limited number of activists to initiate something that would mean the annihilation of Liberation," said Ramon. I returned to Lawton and alerted Felix Antonio Rojas and Ernesto Martini (Freddy). Porvenir already seemed more a series of military stops than an ordinary artery of the city. A convoy of trucks crammed with repressive special troops and a vehicle with a 50 caliber machine gun on top patrolled up and down the long street. Freddy, Felix and I agreed to meet at our parish, St. Clare of Assisi. We notified the majority of our members and friends that we would be there if the populace joined the protest, to join in Lawton. Many hours passed. News that in Havana the disturbances had been quelled was being announced on national television. "Everything is calm now," assured the news. It was around 1in the morning of the sixth. Despite the insistence of the friar friend who accompanied us all the time we decided to go back home at that time. The morning appeared calm, but behind those gray clouds was the latent rebelliousness of a people who had long remained contained. The regime quickly found how to uncover the pressure built up in the populace announcing that one could launch oneself to suicide or freedom given anyone willing to use any handmade maritime means for such an endeavor. Freedom did not arrive that August, but nothing would be the same.